"I don’t want my translations to come across as definitive." Much of our Winter 2018 issue, from the poetry to the microfiction, shows a strongly surrealist bent; writers like Mohammed Khaïr-Eddine and Nina Iskrenko have an almost limitless capacity to juxtapose discordant words that come off like explosive charges. Against this backdrop, Paul Cunningham’s translations of Helena Österlund appear somewhat sparser, though no less jarring. Ôsterlund’s Words and Colors features a pared-down, repetitive voice, a movement through snowy woods, and a terrifying encounter with a sharp-toothed creature. For me, Words and Colors is reminiscent of Beckett’s How It Is, another work where the contours of individual identity seem to dissolve into a blind, frantic momentum through past, present and future. Paul Cunningham’s work has been on my radar for some time: not only his translations but also his original writing and video art. 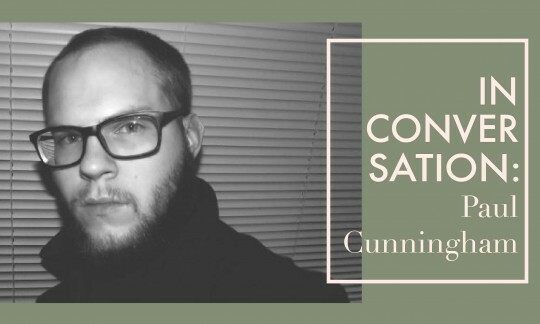 In his translations, Cunningham tends to avoid domesticating the poems into a “natural-sounding” English, instead directly transferring the Swedish language’s natural use of compound words. Imagine if we spoke of the German Schadenfreude as “damagejoy” or Poltergeist as “crashghost,” and you might have an idea of the strange effects this can produce in English. I am always interested in the origin stories of my fellow Scandinavian translators: how they became interested in the languages and their general translation philosophy. I was thrilled to be able to ask Paul a few questions about his previous translations of Sara Tuss Efrik, his video art, and his translation of Österlund’s Words and Colors in the Winter 2018 issue. David Smith (DS): Your former MFA teacher, Johannes Göransson, has written of your translation approach: “Cunningham is not a Swede or a scholar of Swedish culture . . . he only has rudimentary knowledge of Sweden or Swedish, but uses his artistic instincts and dictionaries . . . His work evidences that rather than demanding some kind of scholarly mastery, sometimes translation demands fascination, interest, and a willingness to be vulnerable, to get it done without having legitimized status as Master.” This is beautifully put and intriguing on multiple levels. But I thought I’d start just by asking you to fill in your story a little. What was it that brought you to learn Swedish, specifically? And what was the “fascination and interest” that led you to literary translation?